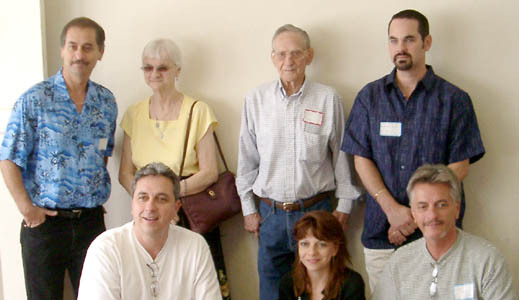 The ninth in the series of Taylor Triangle reunions was held in Lake City, Florida on Saturday, June 21, 2003. It was held at the Lake City Woman's Club on S. Hernando Street on Lake Isabella. Approximately 85 people were in attendance. Many were local, but there were quite a few from out-of-town, one from as far away as Fairbanks, Alaska. Columbia County is the center for the Florida portion of the Taylor clan. Robert, James, Viney, and Ann went Columbia County in the 1850's with Ann returning to Newberry County. Noah, who had gone to Dyer County, Tennessee, moved to nearby Bradford County in the 1870s. All those branches were represented. Israel and George were the only families not represented. Ginny and I arrived at the Holiday Inn on Thursday about midday. That evening William S. (Sam) Taylor and his mother from South Carolina arrived. Mike and Terri Millikin came by to bring the reunion materials that I had previously shipped to them. They also had picked up the key to the Woman's club. We all had a pleasant visit in the hospitality room. On Friday morning, Sam Taylor and I made preparations for the next day's events. We went to the Woman's club and planned and arranged it for the reunion. We then went on a preview of the next day's tour to ensure it would run smoothly. Later on in the day, Ginny and I went to see the owner of Viney's house to gain permission to bring people on the tour the next day. The Friday and Saturday night get-togethers at the motel have become a highlight of the reunions. While these started with the out-of-towners, now many locals attend. This time we had a hospitality room adjoining mine. Helen Craft and Norma Horton provided refreshments at the room. The first people arrived about 5 PM and the activities began. We spent the next 4-5 hours in the room in warm interaction with our relatives: hugging, chatting, looking at photos, looking at documents, and discussing family events and relationships. About 50 came that evening. The Saturday reunion was attended by 84 people as our best count. We had the usual visiting, looking at charts, looking at photo albums, taking photos, and eating lunch. Utensils, paper ware, ice etc were provided by Mike and Terri Millikin. The rental on the hall had been paid by Erma Millikin before she died earlier in the year. During lunch we had the announcements and the handouts. Afterwards we went on a tour of Taylor historical sites south of Lake City, ending at Noah's grave at Old Providence Church. Saturday evening many returned to the motel for further interaction with the kin. On Sunday morning, a group of us went to church at Pleasant Grove Methodist Church. This was an ancestral church of James and Robert. During the service we paid homage to Erma Millikin, a granddaughter of Noah, who was a member there and died earlier in the year. After the service we met at the Holiday Inn in Lake City for lunch. All in all - a great reunion!